Are you having trouble connecting to your Facebook page to Social Media Poster? If this is the case, there are usually three reasons why this is happening. The first reason you may be having trouble with connecting one of your social media accounts is that you haven't provided SEMrush with all of the required permissions. Luckily this is a rather easy issue to solve. The first thing you are going to want to do is to log in to your Facebook profile (that has the required permissions), then navigate to your settings and look for business integrations. 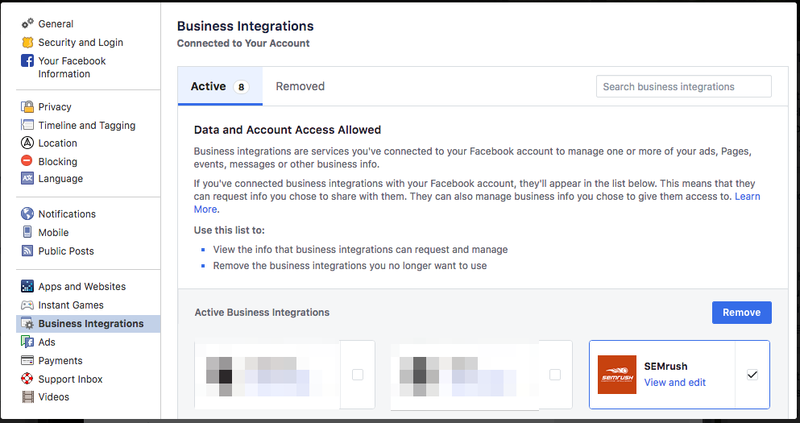 Once you’re in the business integrations section on your Facebook profile, revoke access for SEMrush app then go back into your Social Media Poster and try connecting to your Facebook account again. Make sure you that you are allowing all of the permissions we ask for and you should be good to go. Keep in mind that we do not use, store or even fetch any of your personal data from your Facebook Profile. The second reason why you may not be able to connect is that you’re already logged into Facebook but under a different account. You should double check to make sure the account that has the granted permissions is connected. If it's not, try logging out of your Facebook profile and logging back in with the correct account. Finally, there are various permission levels and types for your Facebook profile. In some cases, you may only have permission to post and not permission to analyze. If you find that this is the case you should contact a page administrator who can promote your access to gain all permissions. If you still have any questions please feel free to reach out to us!